Stepping into the shoes of America's favorite orphan is no easy task. After all, Annie's been around since 1924 (and she looks awfully young for someone in her 90s! ), when the very first Little Orphan Annie comic strip made its debut in the newspapers. Since then, she's been in her own radio show, Broadway plays, and no shortage of hit movies. Like we said, big shoes to fill. But if there's anyone who can take on the persona of this plucky and adventurous little hero and totally do it justice, it's your equally plucky and adventurous kid. 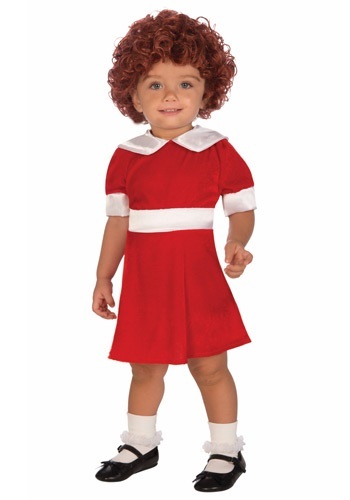 So this Halloween, let her shine in this adorable Toddler Annie Costume! It's got the classic look of Annie's signature suit, complete with a 1920s-style Peter Pan collar and a white satin waist sash and sleeve cuffs, but with modern materials and features for durability and comfort. That includes a velcro opening at the back of the dress, so your little star can get dressed up quickly for her Halloween adventure. In the blink of an eye, she'll be transformed into an icon with this vivid and larger than life dress! The Toddler Annie Costume also makes a great centerpiece to an Annie-themed father-and-daughter "group" costume; just dress dad up as good old Daddy Warbucks (and maybe get a little dog named Sandy, too -- because what would Annie be without her trusty sidekick?) and the classic comic strip will come to life -- with your little one as the star. Just don't forget to add a curly red wig to complete that "Annie" look! I was very disappointed with this costume--the dress is red velour so it looks like a santa costume instead of little orphan annie. Also, my daughter is a very petite 2 year old who still fits in her 12-18 month old dresses. This dress is way too small. The sizing runs very small; there is no way this would fit a 3 or 4T.